Ending a marriage is never easy. It can be emotionally upsetting, financially debilitating and just plain scary. Divorce Professional Alliance (DPA) is a group of pros who have banded together to help smooth the way. A one stop shop if you will. Divorce Professional Alliance members include among others a lawyer, financial planner, realtor, life coach and a private eye. As you move on to the next stage in your life we can provide the services of a trainer, a plastic surgeon, a decorator and a match maker to name a few. 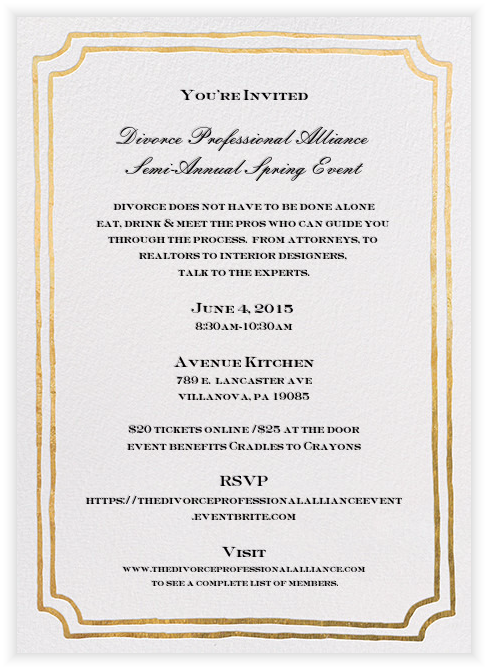 If you are separated or already broken up but not sure where to turn: check out the Divorce Professional Alliance. Join us for our debut event fall 2014 and meet everyone in person.